KANO, Nigeria: Boko Haram’s elusive leader Abubakar Shekau appeared in a new video yesterday to dispute a claim that the jihadist group had been routed from its Sambisa Forest stronghold. “We are safe. We have not been flushed out of anywhere. And tactics and strategies cannot reveal our location except if Allah wills by his decree,” Shekau said in the 25-minute video, flanked by masked armed fighters. “You should not be telling lies to the people,” he said, referring to Nigerian President Muhammadu Buhari, who said on Christmas Eve that the extremist group had been defeated and driven from the forest, its last known bastion. “If you indeed crushed us, how can you see me like this? How many times have you killed us in your bogus death?” he asked. It was not immediately clear where the new video was shot, but Shekau, who spoke in both Hausa and Arabic, said it was filmed on Christmas Day. Shekau last appeared in a video in September where he disputed a claim by the Nigerian military that he had been wounded in battle. He vowed to continue fighting on until an Islamic state was imposed in northern Nigeria. “The war is not over yet. There is still more,” he said, vowing no “respite” for Nigerians. He urged followers around the world to “fight and kill infidels.” “Our aim is to establish an Islamic Caliphate and we have our own Caliphate, we are not part of Nigeria.” Boko Haram, which last year pledged allegiance to the Islamic State group, has been in the grip of a power struggle. 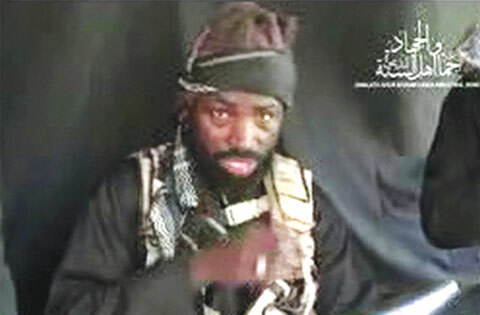 The IS high command said in August that Shekau had been replaced as leader by Abu Musab Al-Barnawi, the 22-year-old son of Boko Haram’s founder Mohammed Yusuf. The fresh video came after Buhari announced that a months-long military campaign in the 1,300 square-kilometer forest in northeastern Borno state had led to the “final crushing of Boko Haram terrorists in their last enclave in Sambisa Forest”. The government in Abuja and the military have frequently claimed victories against the jihadists but access to the epicenter of the conflict is strictly controlled, making independent verification virtually impossible. Attacks have meanwhile continued, casting doubt over claims that Boko Haram has been defeated, despite undoubted progress in pushing back the group.